2012 Pomegranate Harvest is done! Well, mostly... there's still maybe 10 pomegranates hanging on the tree, but they're rather inaccessible at the moment (need a ladder and/or a fruit picker). But this year's harvest yielded almost 2 gallons of cold-pressed juice, which means my team of helpers and I slowly pried all the arils from the pith, then squeezed them in cheesecloth to avoid crushing the seeds inside which would release bitter agents into the juice. The resulting juice was sweet and mellow compared to PomWonderful and similar mechanized-processed pomegranate juice. 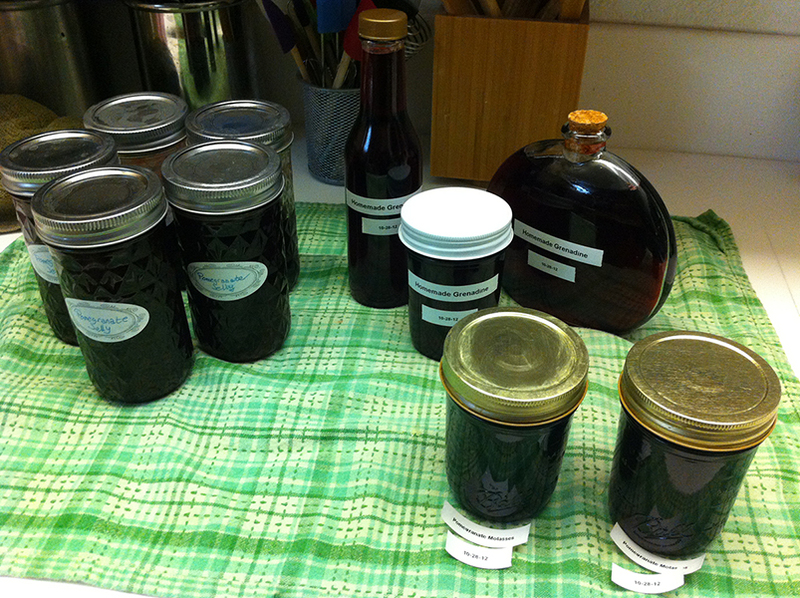 I did a batch of pomegranate jelly a few weeks ago, when we started this processing, and this weekend I finished using all the juice to make more jelly, some hand made Grenadine, and finally Pomegranate Molasses (which can be used like Balsamic Vinegar). The molasses just came out of the hot-water canner, so they're too hot for their labels at the moment.